We use Git as a version control system in our development process and GitHub to host repository. 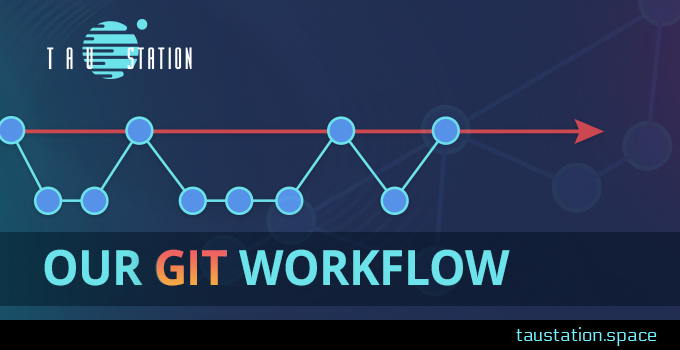 Our workflow is similar to git-flow, but with some simplifications since our product doesn’t use versioning – the only actual version of our game is production. Well, it’s not completely accurate as there are also snapshots of the game on our internal servers, but production is the only version which is accepted for bug reports. Aside from allowing an easy git-bisect, this structure allows us to follow changes that were brought by a particular merged feature branch and revert it, if needed. The name contains an issue number from the issue tracker. You can find a source of git-refresh here, but it rebases the current branch against a fresh copy of master effectively. The latter is actually optional, because we have Jenkins hook on a pull request creation, which will perform a full run of our test suite against the published. This script is similar to git-refresh, but in addition it creates a merge commit and pushes in on GitHub. That closes the PR automatically. Done! Another feature will be included to the next production update. Once a week we choose a point on the master branch, which includes recently completed features and fixes and tag it as a release and move the release branch to the same commit. Then this version gets pushed to the dev server where it is tested. Later it goes into deployment. Perhaps with more developers we would need more formal rules or some extra tools, but we are very happy with our approach at the moment: it lets us spend less time figuring out git and leaves us more time for the development of new features for our game.